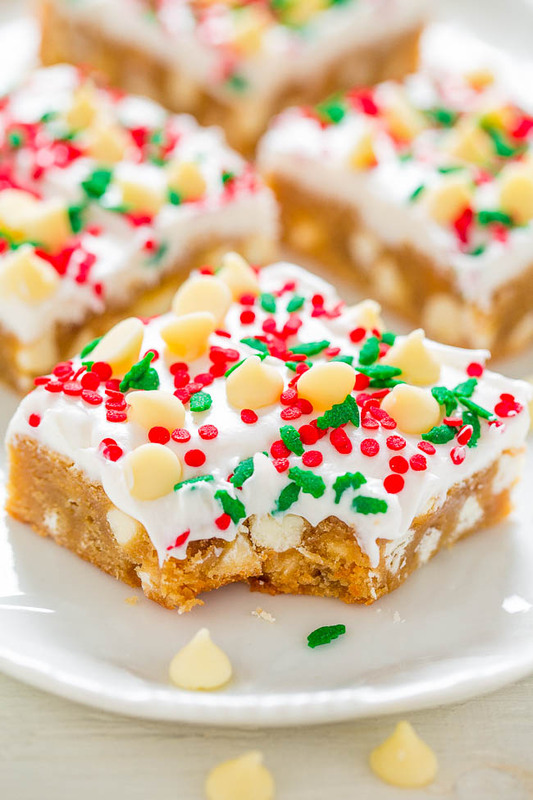 White Chocolate Christmas Blondies with Cream Cheese Frosting – SOFT, buttery blondies loaded with white chocolate, sprinkles, and tangy cream cheese frosting!! EASY and perfect for Christmas parties and holiday events!! 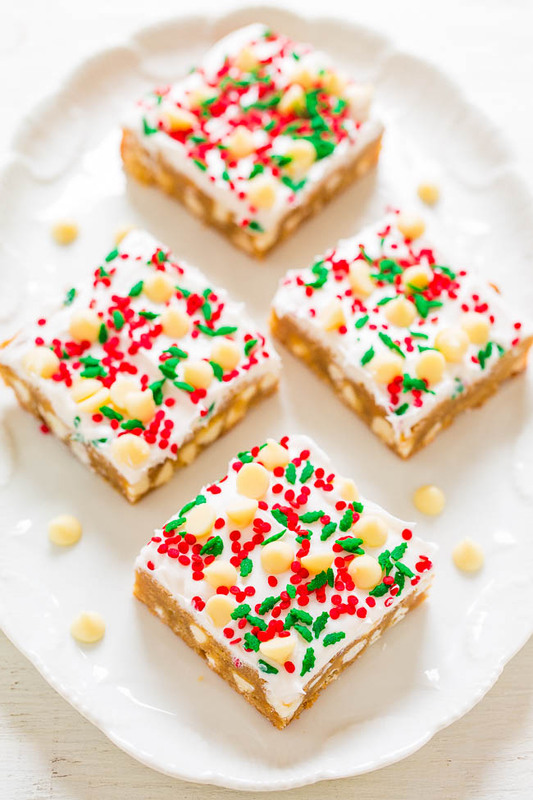 For this holiday dessert that will put everyone in a festive holiday mood, I called upon my trusty blondie base. When I want an easy, fuss-free, one-bowl, no-mixer recipe that I know everyone will love, it’s my go-to. With 30+ versions and counting, it never lets me down. It’s an easy recipe to memorize because everything is ‘one’. In the 1 bowl used, melt 1 stick of butter, stir in 1 egg, 1 cup of brown sugar, 1 tablespoon vanilla, 1 cup flour. And for this version there’s 1 cup of chocolate chips in the batter. 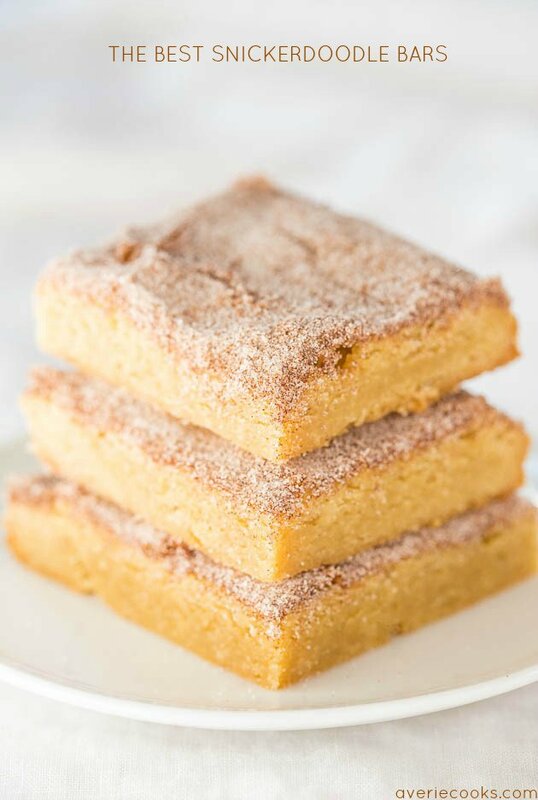 After baking, I topped the blondies with a thick layer of cream cheese frosting. If you’re in a rush before the holidays, and aren’t we all, feel free to cheat and use a store bought tub of frosting. No one will know the difference, promise. 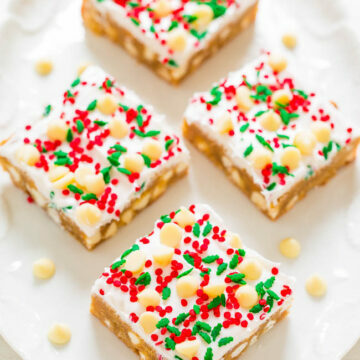 The sprinkles on top and white chocolate chips throughout provide a lovely texture contrast to the soft, buttery bars. The bars are perfect for Christmas and holiday parties or even for a last-minute cookie exchange when you need something much faster and easier than cookies. Another reason I love these blondies. I have a video that shows you exactly how I made them. Turn batter out into prepared pan, smoothing the top lightly with a spatula as necessary. Bake for about 20 to 22 minutes, or until top is set in center and done; don’t overbake. Blondies firm up as they cool. A toothpick should come out clean, or with a few moist crumbs, but no batter. Place pan on a wire rack to cool completely before frosting. Frosting – Use store bought frosting OR to a large bowl, add the cream cheese, butter, and beat with a handheld electric mixer until smooth. Add the confectioners’ sugar, vanilla, salt, and beat to incorporate and until frosting is smooth. 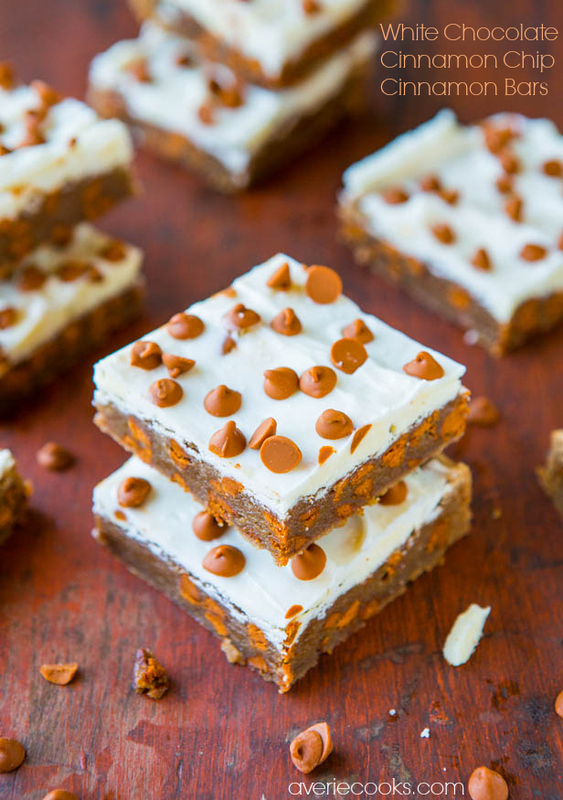 Spread frosting evenly over bars. Evenly sprinkle the white chocolate chips and sprinkles before slicing and serving. Bars will keep airtight at room temp for up to 5 days. I am comfortable storing frosted items at room temp but if you’re not, store in the fridge. 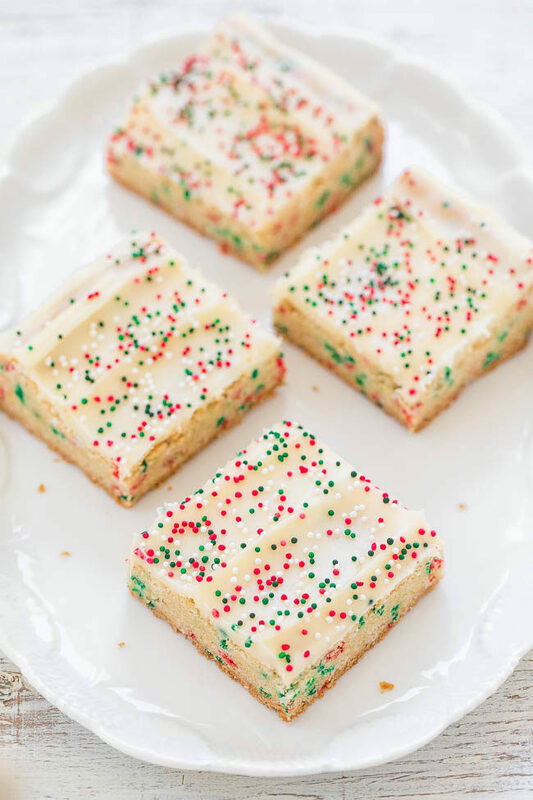 Holiday Sugar Cookie Bars with Cream Cheese Frosting – Sugar cookies in bar form with sprinkles baked in and on top! 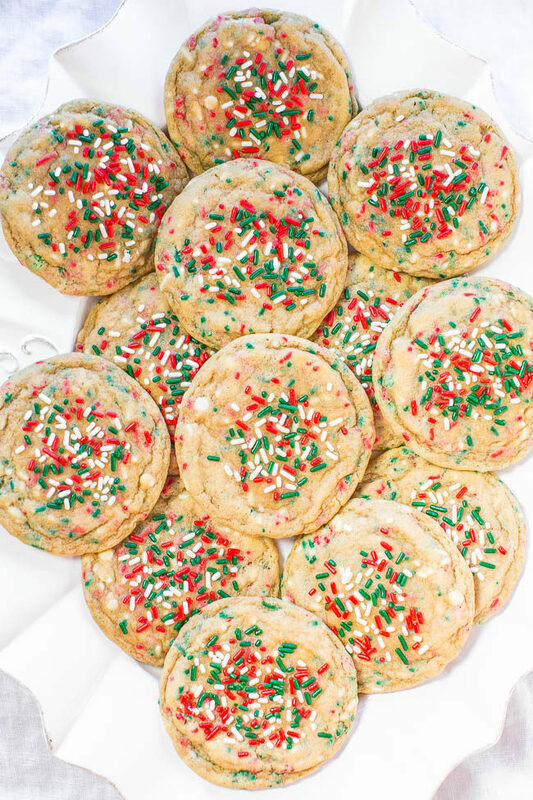 So much faster than making cookies and a great holiday baking shortcut!! 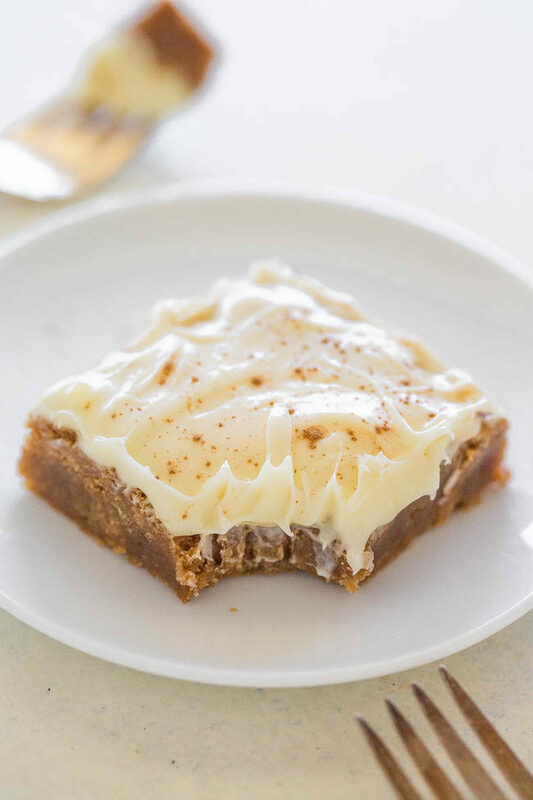 Cinnamon Roll Bars with Cream Cheese Frosting – All the flavor of cinnamon rolls, minus the work! Easy, super soft, chewy, and the frosting truly is the icing on the cake! 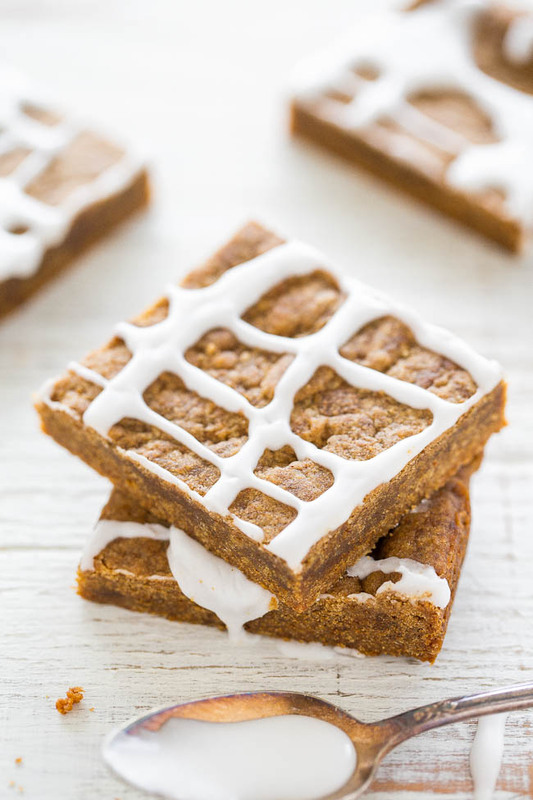 White Chocolate-Topped Cinnamon Chip Cinnamon Bars – Easy bars bursting with tons of bold cinnamon flavor! These sound amazing any time of year! I’ve also been meaning to mention that I like your videos that go along with the recipes too–I’ve seen quite a few of them! Thanks for noticing the videos! They are tons of work and I post them on my social media and they do run on my blog as well. Nice to know you’ve noticed them :) Have a great weekend! Recipes you can memorize are the best! I love how flexible these are! 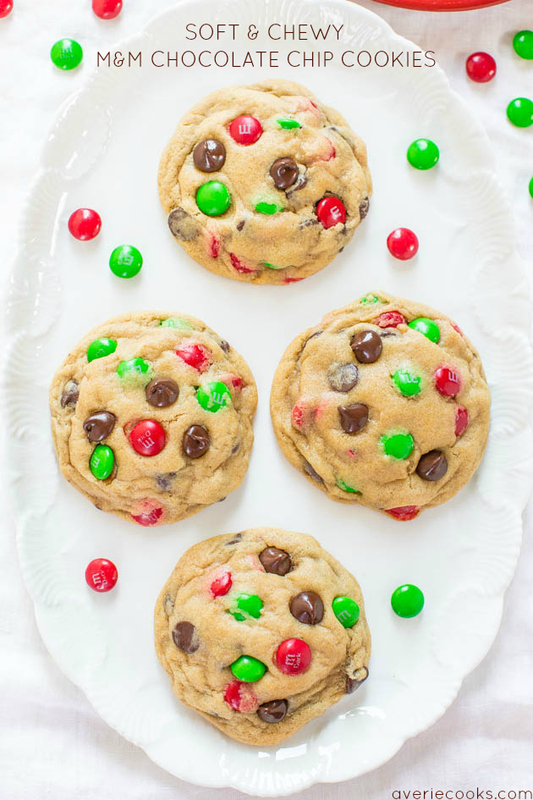 Perfect for holiday baking! 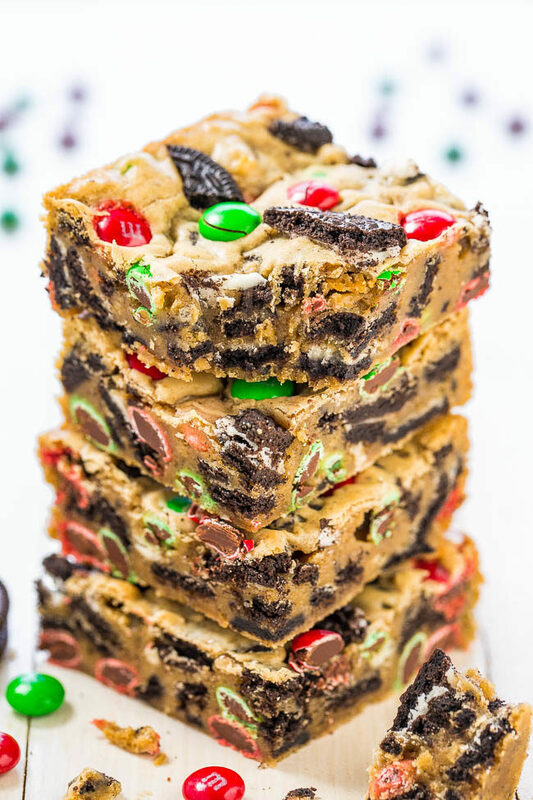 Blondies over brownies any day for me, but especially when they’re holly jolly like this business. Wonderful! You’re truly a blondie whisperer. It’s not missing either. There is none used. Enjoy! 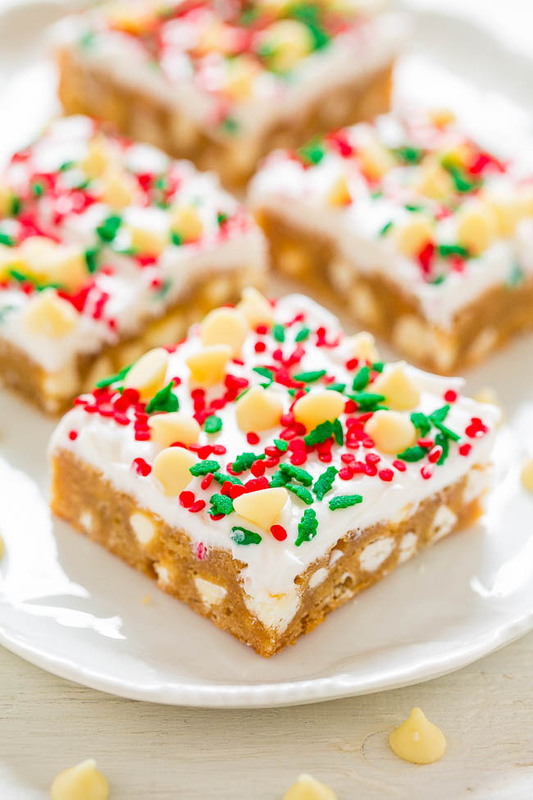 I am a huge fan of blondies and these festive Christmas ones are seriously calling my name! Yum! Pinned! Thanks for pinning! 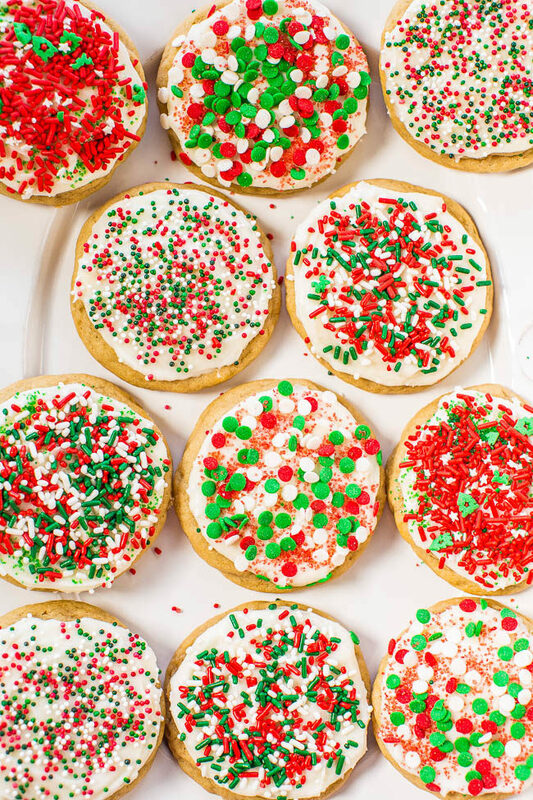 I just saw your sugar cookies moments ago – they look delish!